This cheesecake is probably one of my most popular recipes — and for good reason — it’s AMAZING! It’s really hard to properly enjoy a dessert like this after a full meal. That’s why they hope you’ll spend 6-8 bucks on a slice, or better yet take home a whole cake. But you can make it at home for a fraction of the cost, and you can be assured that your ingredients are the freshest and healthiest too. 1. Preheat oven to 325 degrees Fahrenheit with rack in the center position. 2. Using some of the butter, coat a 10-inch springform pan. 3. In a bowl, mix the rest of the butter with the graham cracker crumbs, 1/4 cup of the sugar and a pinch of salt. 4. Packing it tightly and evenly, press the crumb mixture into the bottom and up the sides of the pan. 5. Bake for 15 to 20 minutes, until golden brown. 6. After cooling on a rack, wrap the outside of the springform pan with aluminum foil. 7. Place the wrapped pan into a roasting pan. 8. In a medium pot, bring water to a boil. 9. While waiting for water to boil, using a mixer; beat the cream cheese until smooth. 10. Add the rest of the sugar and beat until just light. Scrape down bowl sides and beaters as needed. 11. Whip in the sour cream. 12. Add the pumpkin, eggs, vanilla, 1 teaspoon salt and the spices. 13. Whip until just mixed and once done, pour into the cooled crust. 14. Without pulling the rack out, gently place the roasting pan in the oven. 15. Pour the boiling water into the roasting pan until it comes about halfway up the side of the springform pan. 16. Bake the cake about 1 hour 45 minutes, or until the outside of the cheesecake sets but the center is still loose. 17. Turning off the oven; open the door briefly to let out some heat. 18. After leaving the cheesecake in the oven for 1 more hour, carefully remove the springform pan from the roasting pan. 19. Cool on a rack for at least an hour. 20. Run a knife around the edges to loosen it somewhat, and then cover pan and place in refrigerator for at least 8 hours or even overnight. 21. 60 minutes before serving, bring the cheesecake to room temperature. 22. Unlock and remove the springform ring. 23. Place a spoonful of the whipped cream on each slice. 24. Top with a sprinkle of the toasted pecans. Find even more inspiring recipes on Mommy Evolution! 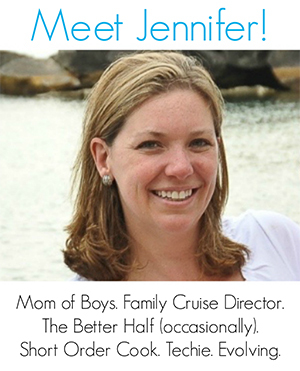 « My Phone, My Self – One Mom’s Plea to Stop Judging Her! Oh my goodness. This combines so many of my favorite things. I’m pinning this, and I’m actually going to try making it. Followed directions exactly…. cake is not cooked through?! ? I am having the same issue. My oven is brand new and electric. Could it be because electric isn’t as hot as a gas oven? At 1 45 minutes it looks like my whole cake is set but when I cut into it its not done. Should I leave it in longer? It’s not the electric. It’s your oven. Get a oven gauge, turn your oven on 350°F, set or hang gauge in oven. When oven gets to 350°F check your guage. More than likely your oven heat isn’t as hot as what you set it as. It’s easy to fix. Google on how to get your electric oven higher. That’ll fix your problem! That’s what I had to do!! Hi Jenny! Wow! The cheesecake looks delicious! I sure wished my family liked pumpkin! I need to find someone who will help me eat this so I can make it! Thanks for sharing! Blessings from Bama! I love the Cheesecake Factory! Thanks for sharing at the #HomeMattersParty – hope to see you again next week. Thanks for sharing at the Inspiration Spotlight party. Shared. Have a great rest of your week. I can’t really say there’s any substitute for cloves. But I did see on a couple of recipe message boards that people skip the cloves sometimes and their pumpkin recipes still turn out tasty. You can use Nutmeg instead of or with Cloves I usually use both.I have not had any complaints so far ..
Great tip. Folks always have their own stylized taste. I don’t see why not! Just be sure to leave enough time for de-thawing. There’s nothing like cutting into the cheesecake and discovering the center is still frozen. ha! I don’t have a 10 inch Springform pan.. can I Bake this in a 9 inch? If so how long do I bake this for? Thanks in advance! I don’t know why you couldn’t bake this is a 9-inch springform… but I don’t know the exact baking timing. I would try it and watch carefully to make sure it doesn’t get overdone. 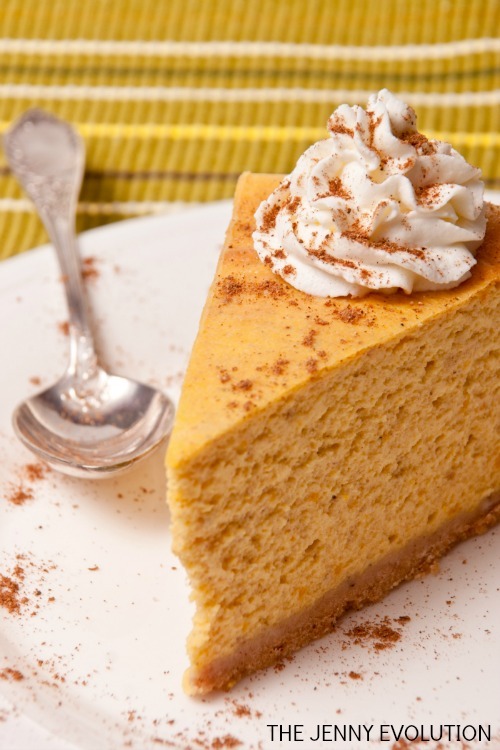 I work at the cheesecake factory in the bakery and I have to say this is very very close to our pumpkin cheesecake! Hahah! Thanks for letting me know my recipe is so close! I have always made my cheesecakes in a 3 inch round cake pan…never had any issues….do you see any reason this cheesecake would not work in the cake pan? You could make it in a cake pan; it’s more about getting the cheesecake out when you’re done. Springforms are just that much easier to get your cake or cheesecake out. Looks pretty spot-on to the slice that my bestie & I shared @ lunch, today …. about the only thing I’d do differently is to use gingersnaps (instead of graham crackers), for the crust – thank you for posting this! Ooo. Using gingersnaps would taste awesome! We wound up using some gluten-free gingersnaps (from Trader Joe’s, which already have chunks of crystallized ginger; for non gluten-free crust, go ahead and use their ‘triple-ginger’ gingersnaps *or any decent gingersnap cookie, really! *) and they worked fine. I couldn’t agree with this reply more! We use GF ginger snap cookies for our crust! We also had to remake the cheesecake due to way too much butter the first time it seeped through the springform pan all over the oven. Cut the butter back to 4 tablespoons and it was perfect! I just saw on Pinterest that someone used your picture – the pumpkin slice photograph with your site name across the bottom – she cut off your words, but it’s clearly your image. Do you happen to have the Pin URL? Thanks. After cooking for the 1 hour 45mins and turning off the oven, can I just leave the cheesecake in the oven over night or do you think it’s best to take it out and put it in the fridge? I definitely wouldn’t keep cheesecake in the oven overnight… personally I’d wait until I had to remove it from the oven (before bed) and then move it to the counter to cool down. It is 1 tsp. in the filling… but make sure you’re using unsalted butter for the filling as well. This recipe turned out so well! Made it into cheesecake cupcakes and baked it for 30-35min. Will definitely make this again! Are you actually baking this essentially in water? or do you leave the roasting rack in the pan as Well? Yes, you are basically baking this in the water… the springform goes in the roasting pan… and the water comes about halfway up the side of the springform pan. How much water do you use, doesn’t say! For the recipe, you pour the boiling water into the roasting pan until it comes about halfway up the side of the springform pan. How long would this last in the fridge? I want to make it on Wednesday morning for Saturday afternoon. Thanks and can’t wait to try this!! Food generally lasts 3-4 days in the fridge, so you should be okay. But if you can make it closer to the date you’re serving it, the fresher it will be. Enjoy the recipe! Can I substitute gluten free graham crackers in the crust using all the other same ingredients? I’ve never really worked with gluten free graham crackers and don’t know their consistency. If you do try it, let us know how it turns out! Has anyone else reading these reviews used the gluten free graham crackers? I am making it with a gf crust right now. I will let you know how it turns out. Would this recipe work with a gluten free pre-made graham cracker pie crust? I’m sure I can cut the ingredients so there’s pie filling left over, but I wasn’t sure if the consistency would work still in a normal crust…? I have looked up other cheesecake recipes and haven’t seen the water thing … what is the purpose of that? This is in the oven now, used a 10″ spring form pan, I had way too much filling, had to make another small one. What went wrong? 2lbs would be 4-8oz blocks right? Hoping this turns out. Can extra cheesecake filling be stored in the refrigerator? Or does it all have to be used right away? Would this freeze well? Would like to make it ahead of time for Thanksgiving, but keep it fresh. 6 days away! I want to make mini cheesecakes in a muffin pan. How would long would I have to cook them? And how many do you think I would get from your recipe? Trying this tonight! Question: What is the point of the roasting pan and boiling water? Do you put the springform pan inside the water bath? I made this cheesecake this past weekend for a mid thanksgiving dinner. We were finally able to enjoy it last night. It was AMAZING!!!! It even made my teenage daughters snapchat story so it must have been a win! I felt it was a bit undercooked but I’ll adjust a few temperature things and it will be perfect next time! Do you put the springform pan in the water? I seem to be the only one around here that likes cheesecake (crazy right?) so I halved the recipe. Do you know about how long I would bake it for? Thanks! I’m making this now & just realized I only used 1lb of cream cheese. ? I don’t know how I spaced that. Is it ruined? Or can I just bake it longer? 12 tbsp of butter for the crust? Is that right?? I had butter pooling and dripping everywhere… eek! Can’t watt to try this. Do you think a chocolate ganache would work? 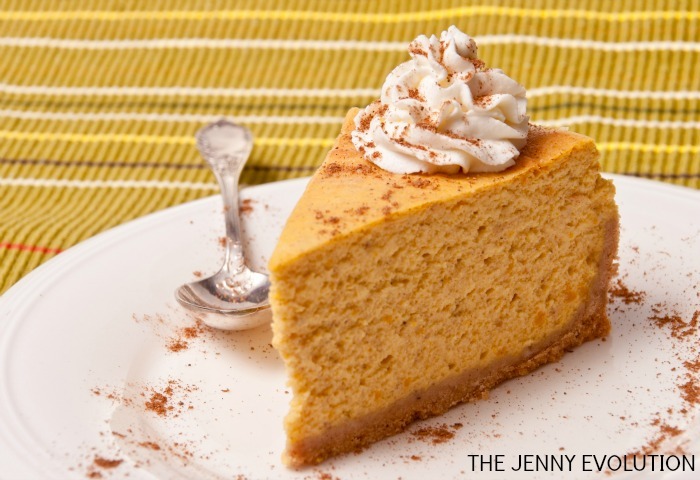 This is the most perfect pumpkin cheese cake ever. Love all of the spices in it. Followed the directions exactly and it turned out perfect. Thank you so much! I don’t have a pan wide enough to place the springform pan into with the boiling water. Am I able to skip this process? I understand its to prevent cracking, however will the cook time vary without this step? Any tips? You didn’t say when to add the pecans and you should make clear not to add the whipping cream to the cake batter. Have a separate section for making whip cream as a topping later. Hope my cake isn’t ruined. Is baking it in water absolutely nessacary? I just realized I do not have a roasting pan big enough to fit my 10” spring pan! Oh no!! What do I do?? I made this pumpkin cheesecake recipe but I didnt bake my crust a head of time like it says to do in the recipe.I also put my water in the pan in the oven while the oven was preheating and I baked the whole cheesecake in the water bath at 475° for 15 minutes then I lowered the temperature to what it states in the recipe to bake it at. It turned out great. No cracks at all in my cheesecake. It was delicious. Great adjustment tips for folks who want to try a different way. Thanks for sharing! This turned out AMAZING!!! Lots of rave reviews. Definitely adding to the family cookbook! My question is can I make different flavors? Can I substitute things for the pumpkin? 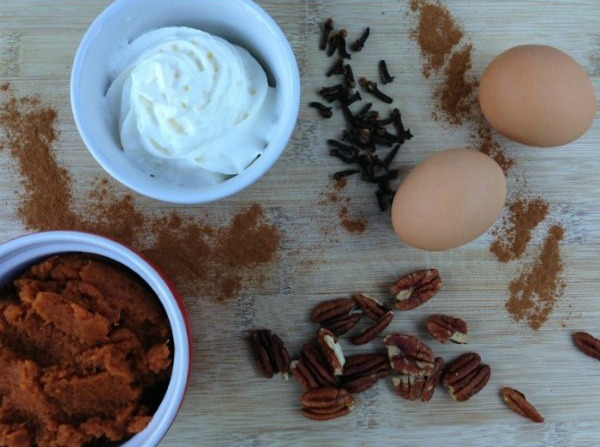 Do the remaining ingredients cook great without the pumpkin? You know… I don’t know! The pumpkin does add the moisture needed so I fear if you take out the pumpkin it might be drier than you’d like. If you try it, let me know!